A lot of people have already known that ice cubes help to shrink pores, but in fact, there are also many other uses of ice that only a few people know. Try one of these following suggestions and verify ice’s magical benefits yourself. If you have to go out and have no time for makeup, ice cubes are your saviors. These ice cubes bring you the feeling of a moisturized and cool skin, and make your skin even more radiant without makeup. And here is the tip: Before applying make-up, wrap an ice cube in a cloth and rub on your face. 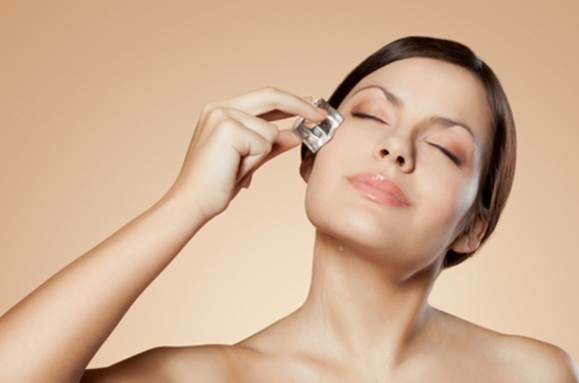 Ice cubes help constrict your pores, make your face smoother and keep the makeup stay for long hours and fresh. Wrap some ice cubes in a cloth and rub on the sunburn affected areas and you will feel an instant relief. This is also a tip to prevent your skin from darkening by the sunlight. 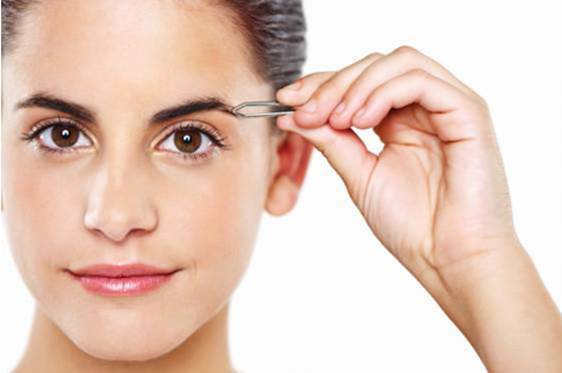 Eyebrow trimming is an indispensable beauty step of women, and it’s undeniable that this will bring you an entirely unpleasant feeling. In this case, rub an ice cube on the eyebrows to numb the area temporarily and reduce the pain. Repeat this after finishing trimming to prevent red bumps on eyebrows. You can also apply this method to hair-removal areas to relieve the pain. Pour some milk into a clean ice tray and put it into the refrigerator. Then, use these milk ice cubes to massage your breasts slowly. This makes your breasts smoother, softer and more toned. Waking up with a pair of puffy eyes with dark circles is a terrible nightmare to women. Luckily, you now can use ice cubes right in your refrigerator to dispel this nightmare. The simplest way is to wrap some ice cubes in a cloth and rub around your eyes. The cold steam will make you feel refresh and helps to reduce puffiness under the eyes. More sophisticatedly, boil rose water and mix it with cucumber juice, then pour the mixture into an ice tray and put it in the refrigerator. Freeze the mixture and wrap the ice cubes in a cloth and rub under eye circles. This will help in fading away dark circles. - 5 Stylish Beauty Looks to Try for Christmas 2013! - 5 Simple & Affordable Skin-Saving Tips to Make You Glow!